A 39-year-old man with a history of well-controlled multiple sclerosis (MS) presented to the emergency department (ED) at our hospital with symptoms of mania and psychosis. His MS had an initial presentation of optic neuritis about 7 years prior. Two months prior to presentation to our hospital, the patient was admitted to another hospital for 10 days due to symptoms of depression, mood swings, paranoia, and suicidal ideation, all of which occurred only a few days after receiving his first dose of intramuscular interferon-beta 1a (IFN-β1a) for treatment of his MS. A magnetic resonance imaging (MRI) scan at that time showed no interval change in his MS. He was given the diagnosis of major depressive disorder and prescribed paroxetine titrated to 40 mg once daily and mirtazapine at a dose of 15 mg once nightly. The IFN-β1a was discontinued at that time due to concern that it may have triggered or contributed to his presentation. The patient's symptoms resolved after several weeks. After discharge, he continued to take paroxetine and mirtazapine as prescribed and reported tolerating them well; he and his wife subsequently enjoyed a week-long vacation. Five days prior to admission at our hospital, the patient received his second dose of IFN-β1a injections (30 mcg) at the instruction of his neurologist who did not think his psychiatric symptoms were related. He presented to our ED with a 2-day history of symptoms consistent with mania and psychosis. According to his wife, herself a health care professional, he was hyperactive, pacing around the house, acting rambunctious, and not sleeping for the last 2 nights. He had scrapes on both knees and the dorsum of his feet from crawling on all fours. He uttered nonsensical statements and had perseveration and echolalia. He conveyed fleeting thoughts of self-harm. On examination, he denied auditory and visual hallucinations. He was oriented only to person and place, and he demonstrated impaired short-term memory. His wife expressed that he had experienced mood swings in the past, but she had never before seen him in a similar state. The patient was a lifelong nonsmoker and did not consume alcohol or use illicit drugs. A urine toxicology screen was positive only for benzodiazepines, which had been administered in the ED prior to the screen. Blood and urine cultures were negative, and a complete blood count and electrolyte values were within normal limits. HIV-1 and HIV-2 screens were negative. Lumbar puncture with cerebrospinal fluid (CSF) analysis was remarkable for elevated leukocyte count with 88% lymphocytes and five oligoclonal bands, consistent with MS. CSF examination ruled out infectious, immunologic, and prion etiologies. Ceruloplasmin, B12, free direct T4, thyroid-stimulating hormone, and prolactin levels were all normal. A chest X-ray and noncontrast head computed tomography (CT) had no abnormalities. MRI showed nonenhancing lesions in periventricular and subcortical white matter in the cerebral hemispheres consistent with imaging done 2 months prior. CT of the chest, abdomen, and pelvis revealed only mild diffuse fatty infiltration of the liver. An electroencephalogram revealed normal brain wave patterns. The patient was admitted, placed on safety watch, and given 2 mg of haloperidol every 6 hours as needed for agitation. Paroxetine and mirtazapine were tapered off. He was prescribed 50 mg of quetiapine at bedtime with the dose increased incrementally to 200 mg. At this point it was thought that psychotic features were being caused by the IFN-β1a treatment for his MS.
Over the course of his week-long hospitalization he improved and returned to his baseline. The patient was discharged with instructions to take 200 mg of quetiapine at bedtime. At follow-up 2 weeks later, he denied recurrence of manic or psychotic symptoms and demonstrated no signs during the interview. His mental status examination was unremarkable and the patient reported good mood and functioning; he had also returned to work without issue. He was instructed to continue taking quetiapine at a dose of 100 mg at bedtime. His wife subsequently left a phone message that he had stopped taking quetiapine, was asymptomatic, and was functioning well at home and at work. The patient presented with a typical history of relapsing-remitting subtype of MS. By all accounts, his neurological features were stable up to his first and only psychiatric admission. This is an important aspect of his presentation because MS itself (although rarely) can present with psychotic features.1 Sibling studies suggest an increased risk of developing MS in patients with prior diagnosis of bipolar disorder or depression compared to siblings who had no psychiatric history.2 Such findings suggest shared pathogenesis or a common genetic susceptibility between these disorders. However, in patients with no prior psychiatric diagnosis, like ours, long-standing MS has not been consistently associated with the development or onset of psychotic symptoms. Limited population-based studies suggest that features of psychosis are present in 2% to 3% of people with MS.3 A recent review of 91 cases suggested that risk factors for development of psychosis in MS patients include female gender and contrast-enhancing fronto-temporal lesions on imaging.4 As discussed by these authors, the study of such association is complicated by a number of factors, namely the timeline of psychotic features (ie, underlying psychotic disorders vs induction of symptoms due to MS pathogenesis) as well as the contribution of medications, particularly corticosteroids and IFN-β. We believe that IFN-β1a played a role in the development of his symptoms of depression, mania, and psychosis during his admissions. The following supports this hypothesis: (1) the patient's symptoms started only after he received the medication, (2) the patient's symptoms resolved shortly after discontinuation of the medication, (3) the patient's symptoms re-emerged after re-initiation of the medication. To the best of our knowledge, there are only a few case reports discussing the presentation of new-onset psychosis in a patient with MS secondary IFN-β treatment.5–7 These cases are briefly summarized in the following text. Goeb et al.7 presented the first published report of IFN-β–induced psychosis in a patient with medical history limited to MS. Their patient had been on IFN-β1a therapy for 8 months prior to his presentation with no change in MRI findings. The patient was treated with haloperidol and clorazepate and the episode resolved in 5 days. Interestingly, the patient had been diagnosed with major depression 1 year prior to his diagnosis of MS. Given that our patient had a history of “mood swings” at baseline prior to onset of mood and psychotic presentation, this suggests an underlying neurobiological susceptibility, so IFN-β1a may be more likely to exacerbate psychiatry instability. Manfredi et al.6 reported a case of a middle-aged patient, with no past psychiatric history and with medical history limited to MS treated with IFN-β (notably 1b not 1a in this instance) for 18 months, who presented with psychosis. The patient's MRI showed no disease progression. He was treated with haloperidol and olanzapine, the latter of which he continued as an outpatient. The patient's psychosis resolved over a 2-month period. The most recent case report presented of IFN-β–induced psychosis was by Lamotte et al.5 in 2012. This patient also had no psychiatric history, did not take medications besides her immunomodulator, and had no recent changes on MRI. To our knowledge, this is the only known report of IFN-β1a–induced psychosis in a female patient. She had been treated with IFN-β1a for 15 months prior to onset of her psychotic symptoms. Again, cessation of the IFN-β and initiation of an antipsychotic (in this case 2 mg of risperidone) medication led to the resolution of symptoms over the course of 3 months. From our understanding of the literature, several common themes can be drawn to help physicians identify similar cases in the future (Table 1). Firstly, most reported cases are male patients; they have no, minimal, or questionable psychiatric history; their medications list is limited to IFN-β therapy; their MS diagnosis is relatively new—the shortest time frame reported being 8 months and the longest (besides that reported for our patient) being 15 months; lastly MRI data for all patients failed to demonstrate disease progression. 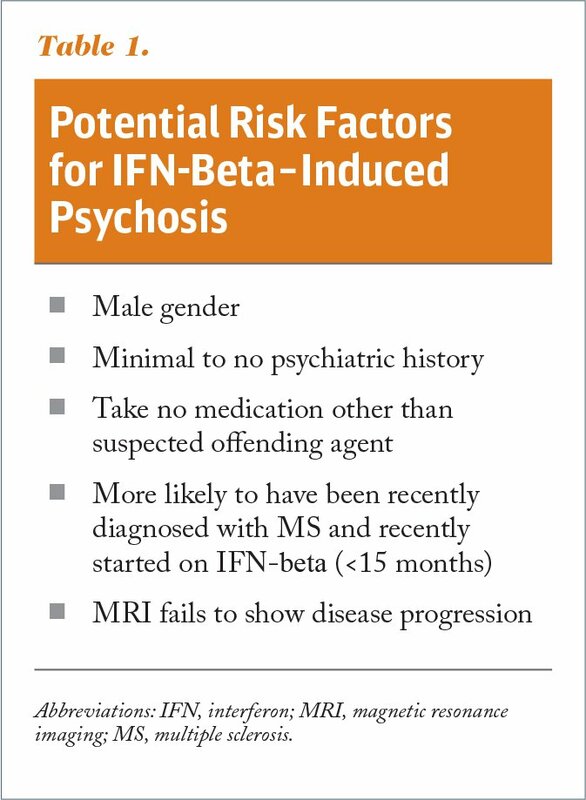 Prior case report authors have pointed to the remission/resolution of symptoms after IFN-β1 as the strongest evidence distinguishing IFN-induced psychosis from psychosis secondary to the progression of MS.6,7 We, too, think this is a fair evaluation and helps to identify an important distinction. For this reason, it is necessary for physicians to evaluate the presence of psychotic features in MS patients within the context of recent diagnoses and medication changes. Future studies examining the prevalence of psychotic features in patients with MS should take care to control for medication dosage and current length of treatment of those medications (taking into account recent hiatuses) before drawing conclusions of the underlying etiology of the presenting psychiatric features. 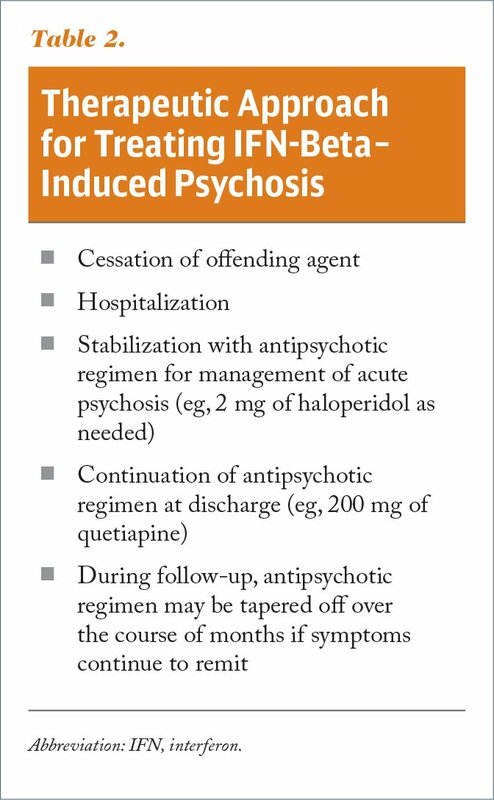 Based on the series of case reports we reviewed and our own experience, we have outlined a suggested approach to the management of suspected IFN-β–induced psychosis in Table 2. Deborah D. Rupert, MS, MA, is an MD/PhD Student, Stony Brook University, School of Medicine. Tyler S. Jones, MD, is a Resident, Department of Anesthesia, NewYork-Presbyterian/Weill Cornell Medical Center. Richard A. Young, MD, is the Medical Director, Adult Outpatient Psychiatry Clinic, NYC Health + Hospitals/Queens. Address correspondence to Deborah D. Rupert, MS, MA, Stony Brook University, School of Medicine, 101 Nicolls Road, Health Sciences Center, Level 4, Stony Brook, NY 11794-8434; email: deborah.rupert@stonybrookmedicine.edu.